For everybody, the simplest solution to climate change would be if we could find a new form of energy supply which didn’t release greenhouse gases. "Slow rate of deployment makes it very unlikely that nuclear power will be a significant contributor to reducing greenhouse gas emissions by 2050." Nuclear power stations generate electricity without any greenhouse gas emissions, and despite public fear, have operated with remarkable safety.In 2015 441 nuclear power plants were in operation, producing 383 GW of electricity and 67 were under construction. Nuclear power plants provided 11 percent of the world's electricity production in 2014. Since 1979, there have been three major nuclear plant incidents. The most recent of these, at Fukushima, involved an unprecedented inundation of the power station, despite which no lives were lost from nuclear radiation. However, public sentiment has turned away from nuclear power. In addition, the decisions to commission new Nuclear Power stations are slow, as is construction (see Figure 1). 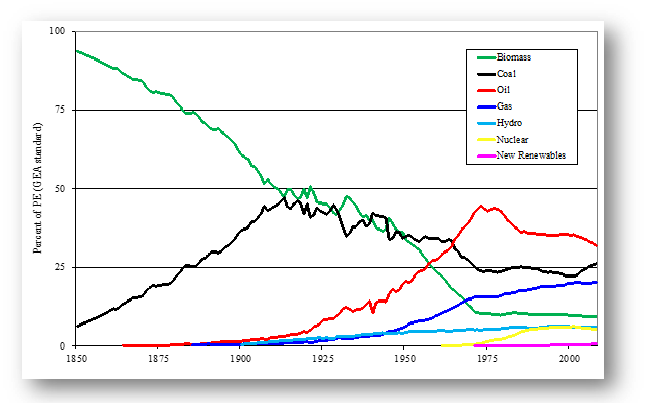 Figure 2 shows the fraction of global energy supply delivered by nuclear power declining. The new Hinkley Point power station was finally agreed by the UK government in September 2016, a decade after the Energy Policy Review launched by Tony Blair gave the go ahead for new nuclear power plants in the UK. Hinkley Point C is currently scheduled to take 10 years to build. This slow rate of deployment makes it very unlikely that nuclear power will be a significant contributor to reducing greenhouse gas emissions by 2050. "The reality is that today, the total effect of carbon capture and storage on global emissions, is so small that it cannot be seen on the figure of total global emissions." The technologies to separate a pure stream of carbon dioxide from the exhaust gases of fossil fuel power stations, and some industrial processes, have been developed and proven at various scales. The resulting carbon dioxide can be captured, compressed so much that it becomes a liquid and pumped underground to be stored in porous rocks. This technique is used at several oil wells as a means to enhance oil extraction, and a first small power station fitted with carbon capture and storage technology was opened in Saskatchewan in Canada in 2014. This is projected to capture and store approximately 1 million tonnes of carbon dioxide per year, and in 2016 achieved 80% of this figure. This technology therefore looks promising as a future option for reducing global emissions while continuing to use fossil fuels, and should be developed and explored as rapidly as possible. 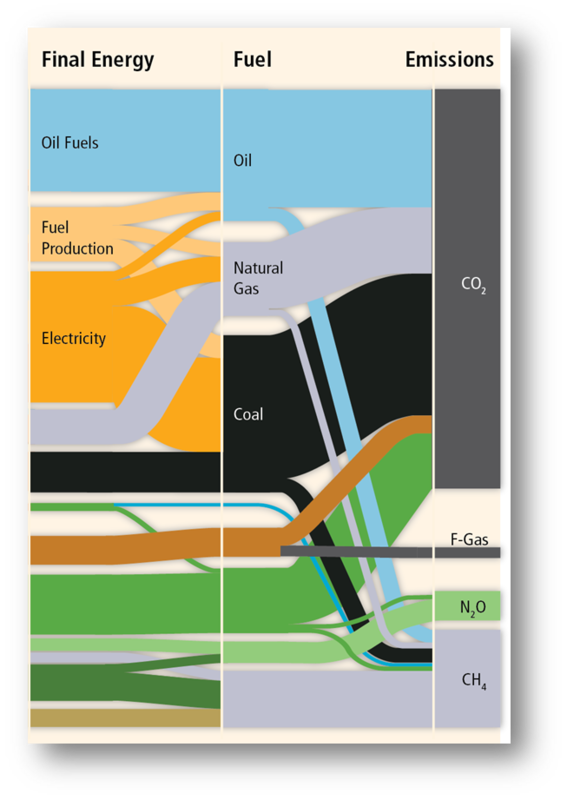 However, the reality is that today, the total effect of carbon capture and storage on global emissions, is so small that it cannot be seen on the figure of total global emissions. We also have no understanding yet of public acceptance of the cost or safety of carbon capture and storage. The long term viability of underground carbon storage has been widely studied, but we lack experience of its reality, and it is a certainty that at some point human error would lead to an unplanned release of carbon dioxide, which would be fatal for anyone at the nearby surface. Remarkably, despite our inexperience of this technology, it is widely discussed in national and international plans for carbon mitigation as if it were a viable option that can be deployed at any scale we plan. 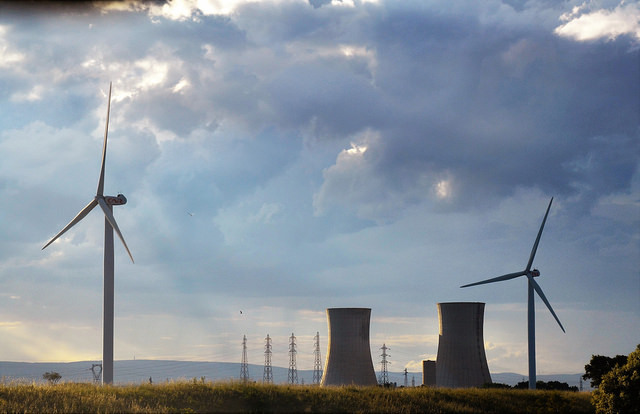 Since 2006, the International Energy Agency has forecast that a quarter of global emissions will be captured and stored by 2050, the technology features heavily in the scenarios and recommendations of the Intergovernmental Panel on Climate Change, and the UK’s Climate Change Committee regularly publishes plans which anticipate its broad and rapid adoption in the UK. Carbon Capture and Storage is very attractive to both politicians and to the incumbent energy industry because it appears to promise something very similar to ‘business as usual.’ In reality, we have so little experience of it, that we have no basis for anticipating any future level of its deployment, and certainly not by 2050. The priority for now is to build that experience but not to assume that it will only be positive. "These ideas are exciting, have triggered great optimism about innovation, and are leading to new and profitable businesses"
Many ideas have been developed for generating energy more directly from the sun – via waves, wind, radiation, plants, rainfall, or the gravitational power of tides. These ideas are exciting, have triggered great optimism about innovation, and are leading to new and profitable businesses. Unfortunately though, the challenge of renewable sources of energy is that they have to be deployed at great scale to be significant, relative to the rate at which we use energy today in developed economies such as the UK with longstanding access to cheap fossil fuels. The table below, 'Power per unit land area' provides a summary of the major renewable options which reports real figures for installed renewable energy generation operating in the UK. 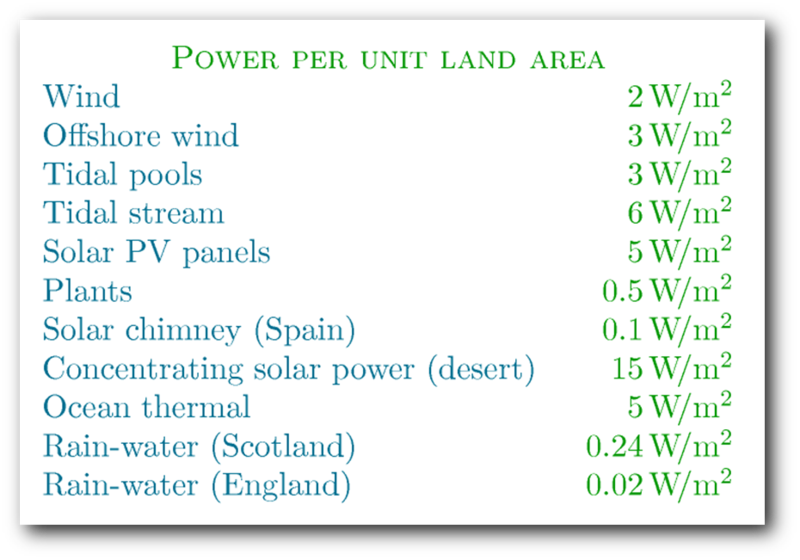 The use of the metric of power generated (Watts) per unit of committed land (in square metres) gives us a simple indicator of just how widely we need to deploy relative to our current energy demand. In the UK, our domestic use of energy (excluding the additional energy used in other countries to make the goods we import) divided by our population averages to around 5,000 W per person. (Watts are a measure of the rate at which we use energy – energy flow.) If we divide the surface area of the UK by our population, we have around 4,000 square metres per person, so therefore if we used all our country to generate energy, we’d need to create 1.25 Watts per square metre. (This is roughly the same in other Western European countries. The one third of Chinese people living in cities also use energy at about this rate, while the two thirds of rural Chinese use very little. Americans use energy at double our rate, but have eight times as much land per person.) Comparing the numbers in the table with this value, we can see that, relative to our current use of energy, bio-energy cannot be a significant domestic supply of energy in the UK. Onshore wind power could supply all our needs if we cover two thirds of our country with turbines, and we’d need a slightly smaller area of the North Sea for offshore wind. We could supply our needs with just a quarter of all our land covered in solar cells (although if we followed the common assertion that we should put solar cells on every south facing roof in the UK, we’d create only 1.4% of our requirements). The technologies may of course improve – particularly solar cells (wind turbines are probably nearly mature and crop yields are unlikely to increase significantly) But even if solar cells became twice as efficient, we would still need to cover one eight of the country with them to meet our current needs. The point of these numbers is not to say that we shouldn’t deploy renewables; it’s vital that we do so. But we should have our eyes open to the fact that we won’t generate anything like today’s level of energy supply from renewable sources. When you think about how much local protest occurs in response to every new proposal for a wind turbine, it’s inconceivable that we would ever agree to give even a tenth of all our land area up to energy generation. 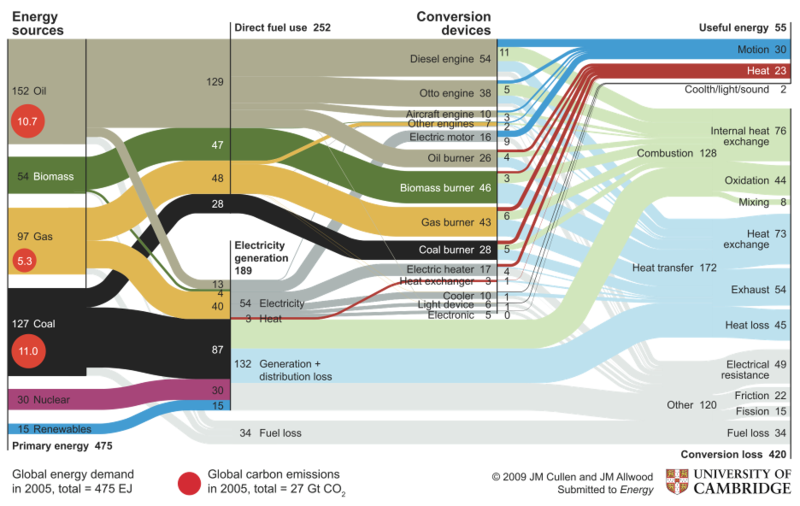 The challenge of replacing fossil fuels comes down to the very reason why they’re so attractive: fossil fuels have tremendous energy density. Nuclear power has an even higher energy density, but we’ve turned against it. Carbon Capture and Storage technology makes use of the same energy density, but we’re so inexperienced at deploying it, and the rate at which we’re developing it is so slow, that it’s inconceivable that it will be a significant part of the global energy supply by 2050. And renewables have a very low energy area density, so will never supply today’s levels of energy. We should pursue all three of these supply options with all possible vigour, but from where we are today, it is impossible that we could supply today’s energy demand by these means. Instead, it seems more realistic to aim at supplying one quarter of today’s level of demand, and by cutting our total demand to one quarter, we would then be on a plausible trajectory to a zero carbon future.